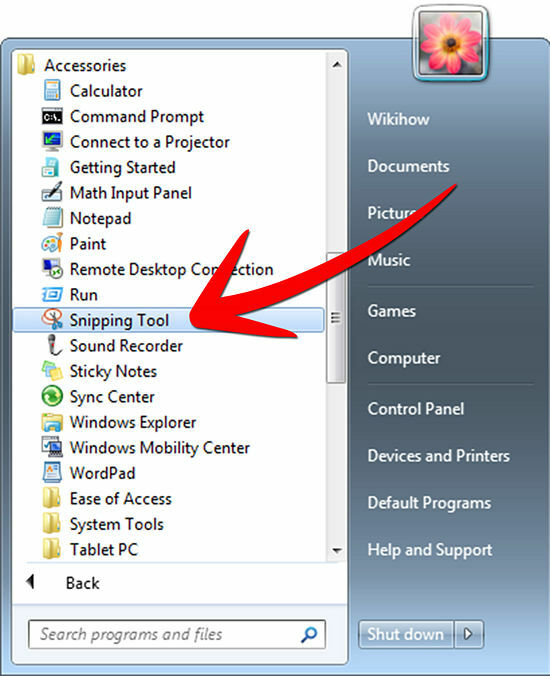 Snipping tool is a handy screen shots tool to cut your printscreen to an reasonable and clearer size. The captured area of the screen appears in the mark-up window, where you can write or draw on it, save it, and send it to someone in e‑mail. For more information, see Use Snipping Tool to capture screen shots. How do I save snips? When you capture a snip, it is automatically copied to the Clipboard so that you can quickly paste it into a document, e‑mail, or a presentation. You can also save a snip as an HTML, PNG, GIF, or JPEG file. After you capture a snip, you can save it by clicking the Save Snip button in the mark-up window. Why are my snips sent as an e‑mail attachment even though I didn’t select E‑mail Recipient (as attachment)? Snips are sent as an e‑mail attachment if you send a plain-text or rich-text e‑mail. To paste a snip into an e‑mail message, specify HTML as the message format in your e‑mail program. Can I remove or change the color of the ink in the outline that’s used to capture snips? To remove the outline, clear the Show selection ink after snips are captured check box, then click OK.
To change the color of the outline, select a color from the Ink color list, and then click OK.
Why does a URL appear below my snip when I save it? In the Snipping Tool Options dialog box, clear the Include URL below snips (HTML only) check box, and then click OK.